We just got back from a vacation on Cape Cod and we have a new addition to our massive stuffed animal collection. 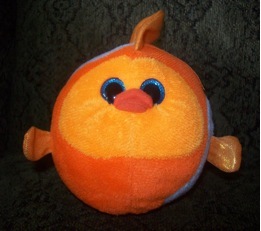 This is Puffy Poodle, which is a strange name since he looks part fish/part bird. There is no doubt he is super cute. We were on the Cape all but 5 minutes when my kids discovered the first of many shops that specialize in tons of candy and a plethora of stuffed animals. The stores all look the same and there is so much candy in them that it is hard to believe it could be fresh. I will say that our visit coincided with a visit from the health inspector and I did eavesdrop when he gave his report to the cashier, stating that the place passed inspection. Truthfully, the store was spotless. It gave me the confidence to splurge on a large sized chocolate peanut butter cup for a whopping $5. Honestly, it was tasty but I could have been just as happy with a 75-cent Reese’s peanut butter cup. 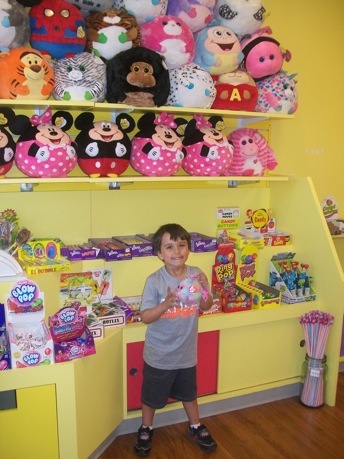 Here is the interior of the store: Yummy fun! Anyway, back to stuffed animals and spending more money frivolously! Now, to be totally honest, I don’t really like stuffed animals. I don’t have anything against them, but I think there should be some type of limit on how many stuffed animals a child can receive in a lifetime. Is that too harsh? I understand the special ones or the ones given by someone so special that they are not replaceable, but hundreds of stuffed objects in piles? They can’t all be special. We have stuffed animals for every holiday and every occasion – the Christmas pony, the St. Paddy’s Day good luck puppy, the graduation bear – one for every year of school because now kids graduate every year to a new grade. When we were kids we graduated from high school and that was it. You wore your mortarboard cap and you got a sheet cake. Oh, and some cards and money. But now everything is an occasion and has a stuffed animal to celebrate it. Now, don’t get me wrong; I love celebrations but after a while you run out of storage for these animals. 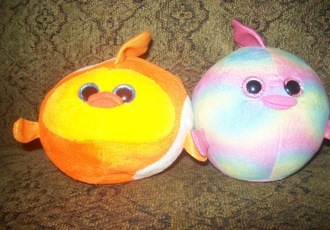 Yes, I didn’t want Puffy Poodle to be lonely, so I bought Bubble Buddy! Who Needs a Night Out? !